What if I told you there is a place only four and a half hours from Auckland that offers stunning scenery, beautiful white, sandy beaches, countless picturesque walks and hikes, good coffee, great fishing and surfing, and friendly locals, but that never gets overly crowded – even during the busy summer season? Believe it or not, such a place exists. 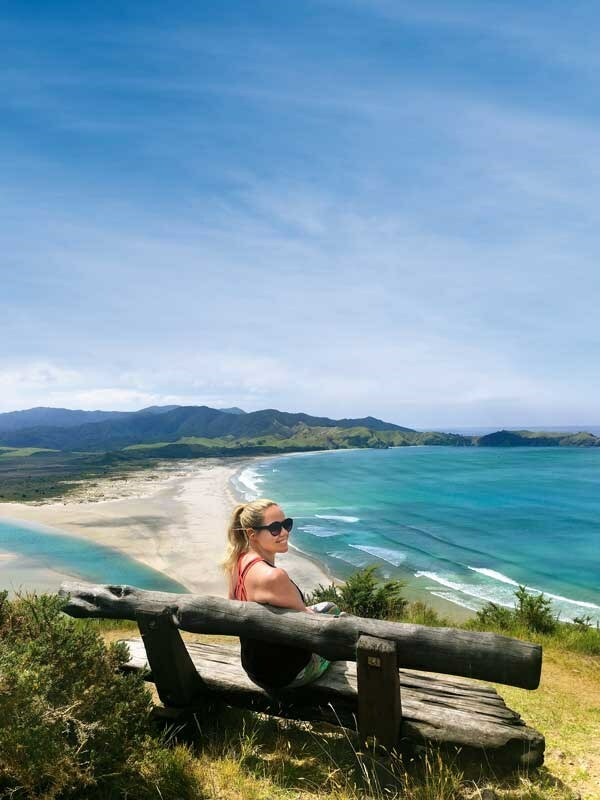 It’s called Great Barrier Island and might well be one of New Zealand’s best kept secrets. That’s not to say it’s everyone’s cup of tea. Getting there is a bit of a mission and not cheap, cell phone reception is often patchy, campgrounds only offer cold showers and long-drop toilets, driving faster than 60 kilometres an hour is basically impossible thanks to the narrow and windy roads, and if you’re looking for a movie theatre or shopping complex, you’re out of luck. What might be a little too basic and boring for some is heaven for those of us who love nature and the feeling of getting away from our busy lives. I fell in love with Great Barrier when I first visited back in 2013 for a week, and again in 2016. 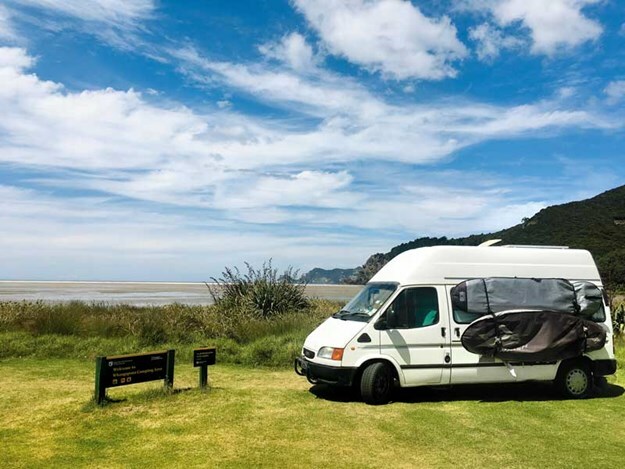 Since I now call a 1999 Ford Transit campervan home, I decided to make the most of it this year and take the van over to the island for three weeks to really have a chance to enjoy it and explore. Great Barrier, also known by its Maori name Aotea (which means canoe), is a special kind of place. 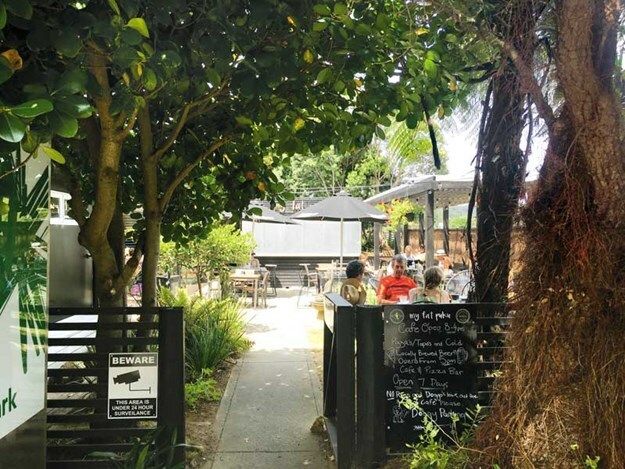 Located in the outer Hauraki Gulf, about 100 kilometres north-east of Auckland CBD, it’s technically part of Auckland, but in reality, it’s a world of its own. Remote and without any power- or phone lines connecting it to the main island, the Barrier runs on water tanks, solar power and generators. Even though the island is twice the size of our capital city, less than a thousand people call it their permanent home, most of them living off farming and tourism. About 70 percent of Great Barrier’s 285 square kilometres is protected conservation land, and thanks to its mind-blowing night skies, the whole island is a Dark Sky Sanctuary. The island’s east coast offers vast white, sandy beaches while the west coast is a boating and diving paradise with many sheltered bays. In between are lush green mountains. Claris, on the east coast, is the main centre and home to the airport, council office, library, a grocery shop, petrol station, a handful of cafes and restaurants, a medical centre and a little gallery and gift shop. You’ll also find shops and other signs of civilisation in Tryphena and Port Fitzroy. Otherwise, the island is all about nature and getting back to basics. If you want to bring your motorhome or caravan (or any other vehicle), there is only one option: the four-and-a-half hour journey with the SeaLink ferry from downtown Auckland to either Tryphena or, less frequently, Port Fitzroy further up north on the west coast. While the ferry trip is slow, on a beautiful day it is an attraction in itself (look out for dolphins; they like to swim along in the ferry’s wake). On a rough day, the ride over can be more of an adventure than an attraction, especially for those who quickly get seasick – but still worth it. The cost for the car ferry varies depending on the season, and the size of your vehicle. It’s best to check directly with SeaLink. For those who don’t want to take a vehicle over, the much faster Hauraki Express passenger ferry or a 30-minute flight from Auckland with Barrier Air or Fly My Sky offer alternative options. There are no official freedom camping spots on Great Barrier, and you’ll have a hard time finding nice places to park up for free. Much of the island is not accessible by car or is private land and there aren’t many public car parks that would make good overnight spots. I recommend staying at one of the DOC campgrounds. It’s only $13 per person per night, and I am happy to pay this considering the amazing job DOC is doing looking after the campgrounds, the wildlife and the walking tracks. The DOC sites are relatively basic but in idyllic locations and usually close to a beach or other spots worth visiting. All of them have cold showers, long-drop toilets and sinks to wash dishes. Over summer, some can get busy, but after the end of the school holidays, you might well find yourself alone for the night at any of them. It’s also worth noting they’re mainly just big grass areas and finding a flat spot to park can be tricky. Bring your levellers! Medlands Beach Campground is where I spent most of my time. It has easy access, the most modern facilities of all the campsites (still just cold showers and long-drop toilets), is only one-minute walk from a big, beautiful beach and is right by a stream that offers safe swimming for the little ones. Harataonga is probably the second most popular campground. A short walk from the stunning Harataonga beach and the starting point for one of the island’s most popular walks (Harataonga to Okiwi), this spot is well worth a visit. However, larger motorhomes and those towing a caravan should be aware that access is via a narrow gravel road. The last kilometre, in particular, could be an adventure and it might be worth sending someone down on foot to stop traffic from coming your way if you’re driving a large vehicle. 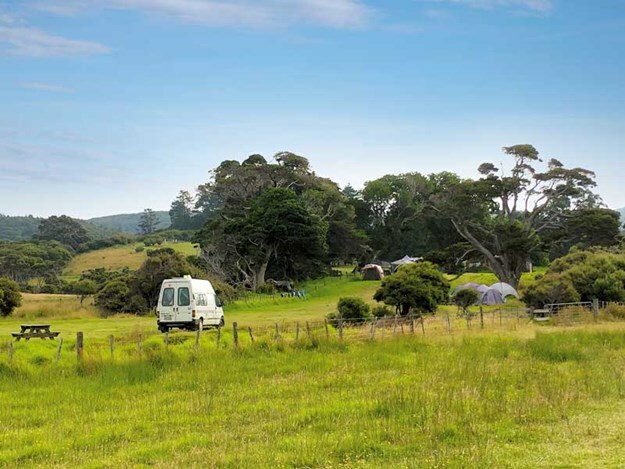 Whangapoua (also known as Okiwi) is a smaller, fairly basic and quite exposed campsite. The main attraction of this option is the world-class surf break at the entrance of the estuary. In other words, how busy it is very much depends on the swell forecast. 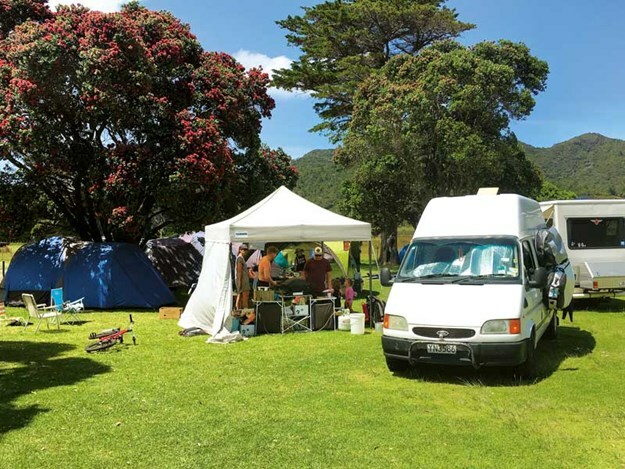 Akapoua Bay is the only car-accessible DOC campsite on the west coast. It is an idyllic spot by Port Fitzroy with easy access to some lovely walks. There were only two other campers here when I stayed, even though it was the second week of January. Awana is another stunning beach on the east coast with a DOC campground close by. 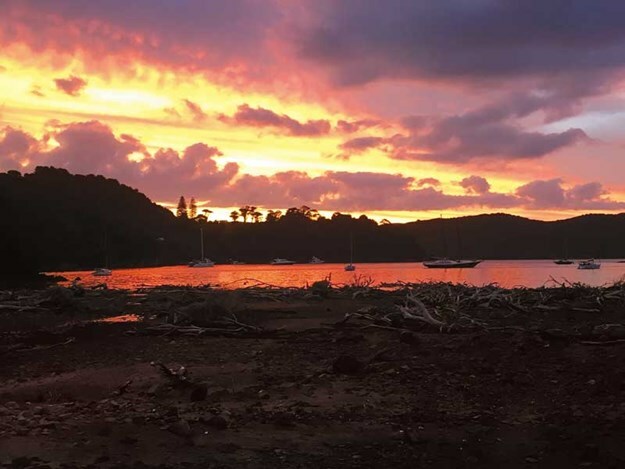 You’ll find a kids-friendly estuary here and, if you’re lucky, some great surf.There are also two or three private campsites and a few DOC huts, and campsites that are only accessible on foot. You can learn more about these on the Great Barrier Island Tourism website or find them via the NZMCA or CamperMate mobile apps. The Barrier is the perfect place for surfing, fishing, kitesurfing, kayaking, paddle boarding, swimming, snorkelling, diving, boating or any other water sports you can think of. If you don’t have your own gear, there are a few places on the island that rent out kayaks and some fishing charters as well. Ask around when you get there for the best options and current hours of operation. The hike from Windy Canyon up to the top of Mt Hobson, the highest peak on the island. Go on a clear day, and the views will be simply breathtaking. There are longer routes to the summit as well, for the more serious hikers. Harataonga to Okiwi is a longer (12 kilometre) walk but relatively flat and well-formed and offers beautiful views of the coast as well as the bush. The Harataonga Loop walk, which starts from the campground and takes you up the hill to amazing views over the coast, is a bit of a climb but only takes about 45 minutes and the vista is worth it! Walk from the top of the hill between Medlands and Tryphena back down to Medlands beach (about two to two-and-a-half hours) for a bit of a workout and gorgeous views over Tryphena. From the campsite in Akapoua, a short walk through the forest – with several stream crossings – leads you to a waterfall. On a cooler or rainy day, visit the natural hot pools between Claris and Whangaparapara Harbour. The walk from the car park is easy and suitable for strollers and wheelchairs. Once you get there, make sure you check out the smaller pools further upstream. Stargazing is a must while on the island. On a clear night, grab a picnic blanket and maybe a bottle of wine, lie down and enjoy the world-famous night sky. Play a round of golf at the nine-hole course by Claris. Keep an eye out for fun local events while you’re there. From sandcastle competitions to the annual Mussel Festival in Port Fitzroy or events at the Great Barrier Social Club, there is usually something happening somewhere during summer. Sit back and relax with a good book. There are not a lot of places in the world where relaxation will come easier than here. Dumpstations and fresh water access, or should I say the lack thereof, are two of the big challenges when visiting Great Barrier Island, especially when you want to stay for several weeks. There is one dumpstation on the island, by the landfill in Claris. However, due to its limited capacity, you’re only allowed to dump black water (not grey water), and there is nowhere to fill up drinking water. While all the DOC campgrounds have fresh water, they recommend you treat it before drinking and they all run on tanks so would probably be less than impressed if we came and filled up our 100-plus litre water tanks. This is another reason why I recommend staying on campgrounds as you can use their facilities to do dishes and shower, significantly reducing the amount of fresh water you need and the amount of grey water you produce. I filled up my water tank right before I left and used it mainly as drinking water. My 80 litres lasted over two weeks, and I only had to buy some extra drinking water for the last few days. While the Barrier is remote and basic, it does have pretty much everything you need. There are several little shops on the island that stock groceries and other essentials. However, be aware that buying food (or anything else) is expensive. I always bring as much as possible with me. Having said that, My Fat Puku in Claris does excellent coffee, breakfast and pizzas so is well worth a visit, and I can also recommend the Pa Beach Café right next to the Stonewall Store in Tryphena. If you’re after a quick but filling treat, try the burgers and hot chips at Swallow on the main road in Claris.You can find a petrol station in Claris, and you can also get fuel at Mulberry Grove by Tryphena and Port Fitzroy, but be aware of the sometimes limited opening hours (especially in Port Fitzroy). There are laundromats in Claris by the petrol station and Mulberry Grove at the back of the store. Both charge around $6 for a load of washing, which seems reasonable given the whole island relies on tank water. And if you find yourself in need of a pharmacy, you’re also in luck. There is one on the main road in Claris, where there’s also a health centre should you need one. If you want to go over in summer, book early. The ferry sailings tend to book out months in advance, and even campgrounds can fill up. While all the main roads on the island are now sealed, many of them are narrow and windy, and access to most of the campgrounds is via gravel roads (mostly short ones). For confident drivers, there is nothing you can’t handle, but for people who are less confident or have large vehicles, I would probably recommend staying clear of the busier time around Christmas and New Year’s. And if you’re thinking of taking a 10+ metre bus over, it might be worth popping over for a quick visit without it first so you know what to expect. Bring cash. There are no ATMs on the island. While most shops have EFTPOS, the machines can be moody, and the checkout clerks will be grateful if you have cash. The Barrier tends to run on its own schedule. Don’t expect the same consistent opening hours that we’re used to in the cities. Having said that, over summer most shops tend to be open all day. If you’re like me and need to be able to do some work while you are on the island or need internet for other reasons, the Claris Library offers a great place to work, with free Wi-Fi. 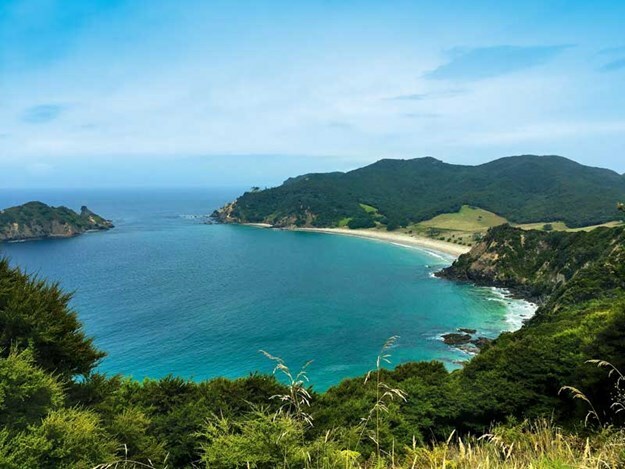 The Great Barrier Island Tourism website is your first port of call for information about the island and its attractions. greatbarrierislandtourism.co.nz. On the DOC website, you can learn more about the parks, hikes and campgrounds. doc.govt.nz/great-barrier-island. Two other websites that offer valuable information for visitors are thebarrier.co.nz and greatbarrier.co.nz. Visit the SeaLink website to check ferry sailings and rates – sealink.co.nz. Ask the friendly locals for recommendations when you get there; they’re often the first to know what’s going on!